To date, the most popular Haitian dish all over the world is none other than Haitian Griot. It is often served with cocktails at parties and family gatherings. Many people attribute the magic in Haitian Griot to the sour orange juice and a right balance of salt. Mix together in a bowl the pork, Sour orange, onions, shallots, green peppers and salt. Pour mixture into a ziplock bag and massage. Refrigerate overnight. Cook the marinated pork on the stove for 60 to 90 minutes. Once cooked, drain the mixture. Heat the oil in a skillet. Fry the pork until it turns brown and crusty on the outside but tender on the inside. Mais Moulin or Corn Meal is a traditional Haitian dish usually served with sliced avocado. What do you need to make Mais Moulin or Corn Meal: corn meal, water, minced garlic clove, chopped onion, thyme, parsley, oil, salt, black pepper, and hot pepper for flavor. After the garlic and onion are sauté garlic in oil, add water and bring to a boil. Combine the ingredients. You must stir mixture repeatedly to avoid clumps and lumps. The formation of lumps will affect the taste of this delicious preparation. After stirring for a considerable amount of time, once you get sure that the mixture has not aggregated into lumps reduce the fire and after 10 to 15 minutes, it is ready to be served. 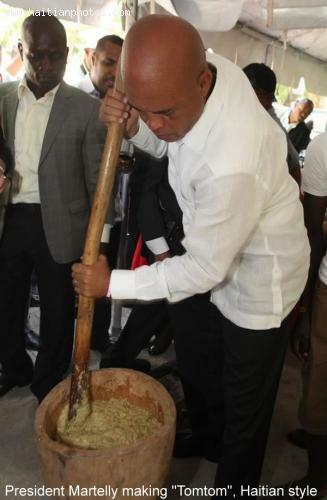 Here is a picture of Haitian President Michel Martelly making Tomtom. 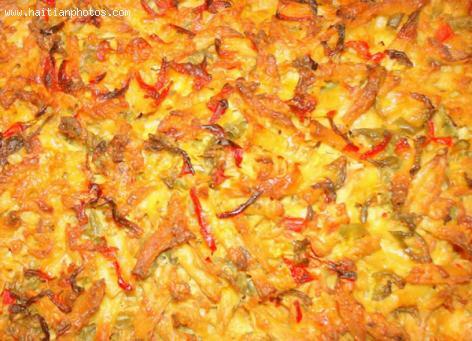 This Haitian dish Tomtom is a signature dish from South of Haiti. Breadfruit With Okra is also called in Haitian Creole Tomtom ak Kalalou Gombo or Veritab ak Gombo. Some argue that the dish is originated from the city of Jeremie in Haiti and considered to be traditional to the town. The dish is dated back during French colonization of Saint-Domingue (now Haiti) when it was the everyday dish of the Haitians. Breadfruit is very plentiful in the island and its yield is one of the highest for any food plant. Gombo or okra was also easy to come by in colonial times because it grows quickly in tropical climates. Haitians has a famoiu proverb: "Ou sèl dwèt pa manjé kalalou gombo". English version: "One finger does not eat OOkra"
One thing that differentiate the people from the North of Haiti to the rest of the country is their cooking with cashews. This has become a signature dish for there people. You will find cashews whether they are cooking fish, pork, chicken or beef. 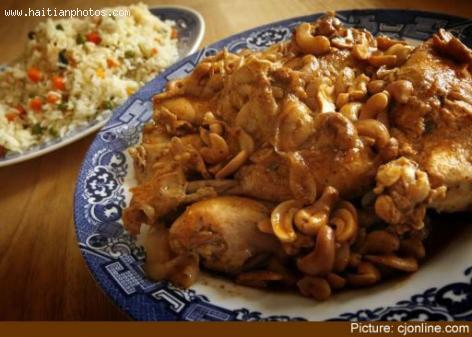 The most famous dish of all is Poul ak Nwa (Chicken with Cashews) a North Signature Dish. Poul ak Nwa may be also accompanied by rice. The Haitian Accra is an an appetizer. 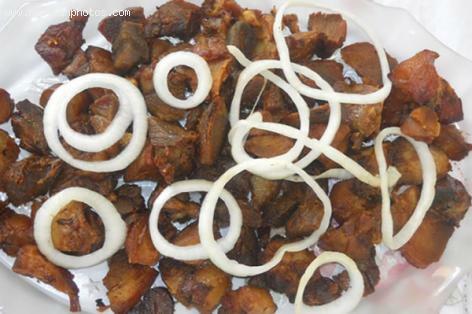 It is often served at parties along side with Griot (fried pork) or fried beef. It is also accompanied with fried plantains and the famous haitian pikliz. You mix all the ingredients, except oil, in a large bowl. Let batter rest for several hours. Then, pour the batter by spoonfuls into a pan of heated oil. Fry the Acra on med high heat until golden brown on both sides. There are other recipe variations for the Haitian Accra as part of Haitian "fritaille" like adding black-eyed peas, flour and egg. 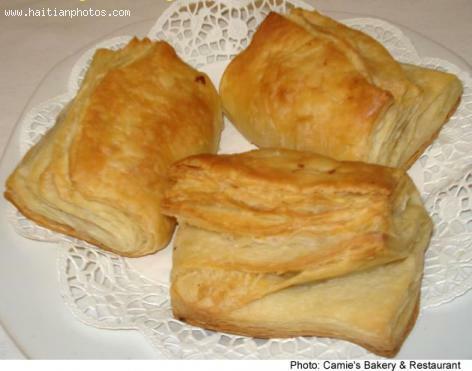 Haitian patty is called in Haitian Creole "pate" (pronounced pah-tey) derived from the French word "patisserie" and consists of delicate, flakey puff pastry surrounding some sort of filling. There is a great emphasis on producing delicate layers. Like most pastries, Haitian patties are best when they are fresh out of the oven in the morning, making them an ideal choice for a breakfast on the go, especially if you're one who prefers something savory for breakfast over something sweet. There are two main shapes to take into account with Haitian patties that usually denote the two most popular fillings: beef patties (and sometimes chicken) are square while cod patties (and sometimes herring) are triangular. This is one of my favorite dishes that mother would make every Saturday. What do you need in order to make a the Best Haitian Bouillon. You need to have well seasoned and baked golden brown cut turkey necks, turkey backs, chicken feet, blue crab claws, fresh cut legumes, mustard green, spinach, cabbage, and cut carrots. Put all the vegetables in a large pot, add beef broth, cook well, add meat, make dumplings. 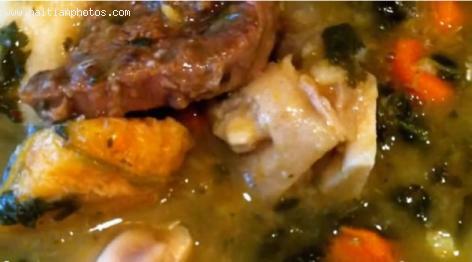 Crush the malanga in the soup to make it thicker. Ingredients: 1.5 (16 oz) macaroni packages, 1 whole onion, diced, chicken broth cubes, cheese block, cut into small cubes, 1 carnation milk, 1/2 cup of butter and 1 cup of parmesan cheese. Have a large pot of water to boil over high heat. Add the macaroni. Add the onions and Maggi chicken broth as the macaroni gets soft yet firm. Then, you need to reduce heat and keep stirring occasionally. Add the cheese, until melted. It is extremely important to keep stirring constantly to avoid the cheese from sticking to the bottom. After a while, add butter and cheese. 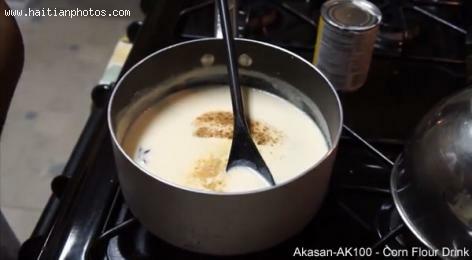 Then, pour in the carnation milk and stir. 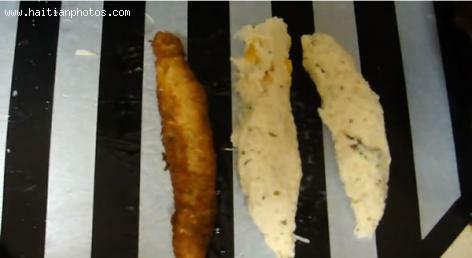 Remove from heat and pour into a greased baking sheet. With oven at about 300 degrees, place in oven and bake for an hour. Who can say he/she does not like Haitian Kremas. 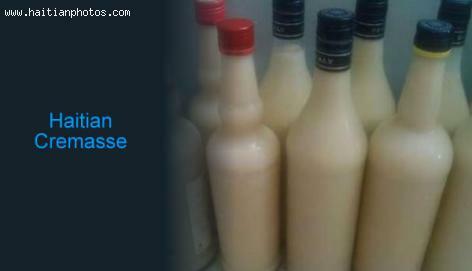 Whether your young or old, this is one alcoholic drink that is acceptable for everyone in the Haitian culture. It is made usually on special occasion such as Christmas, wedding. it's mostly sugar and a dash of alcohol.